I have a question about deck stains or porch stains. I am wanting to “re-stain” my back porch floor to make it look “fresh”, uniform and shiny and to keep it protected. The porch is about 30 years old and is covered by a roof so minimal sun and weather exposure. It currently has dark stain that is wearing in some places but no peeling. I don’t know what kind of wood or stain/poly has been used on it. It is worn in parts but still has some unknown “sealer” present in more protected areas. I am willing to rent a floor sander to scuff up the floor but don’t want to sand to bare wood. It doesn’t have to be pristine but it does need to look good and protect the floor from future weather damage. I plan to use semitransparent deck stains in a dark color. Do you think this will work and if so, do you have a specific stain to recommend? I can not give a direct answer as to what type of stain you should use because you are unsure of the type already in use. Instead I can give you some information on the types of stains and sealants available and how they may be used together. Stains are available in a wide variety of colors and bases and are used for interior and exterior applications. Exterior deck stains are available in oil base or latex. Oil base deck stains usually have much thinner viscosity than latex deck stains or paint. Oil stains utilize a carrier agent that evaporates and a pigment that imparts color to the wood. When applied the carrier agent soaks into the wood drawing the pigment along, thereby coloring the the wood without covering the grain. However some, darker, oil base deck stains are thick enough to build up on the surface of the wood but still do not exhibit the same appearance as a painted surface. Unlike some latex deck stains and any paint, oil based deck stains do not peel. In high use areas’ the surface of the wood may be worn down further than the stain penetrated, thus exposing wood that still exhibits it’s pre-stained color. Latex stains are analogous to latex paint. Indeed many latex stains have a consistency similar to paint that has been “thinned”. Some semitransparent latex deck stains have a viscosity that is thin enough to allow penetration into the wood like oil based deck stains, and like oil based stains are subject to wear-through but not peeling or flaking. Latex deck stains with increasingly thick viscosity perform more like paint in that they build up on the surface, forming a film that is subject to wear-through, peeling or flaking. 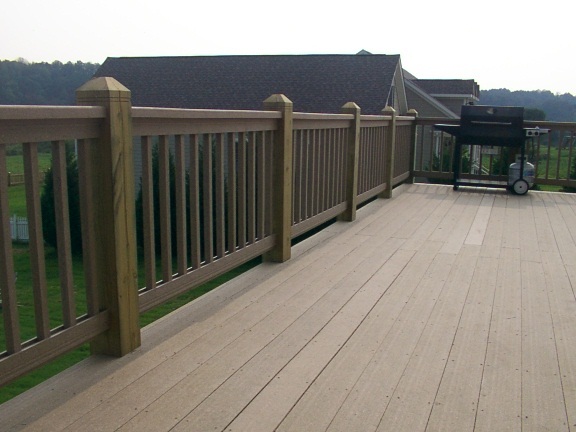 Read the post, Staining Decks, for more insights on how to stain a deck or porch. Exterior deck or porch floor sealants may be oil or water based. They are usually clear but may exhibit an amber color. Sealants, like stains, may work by either soaking into the wood or by building a film on the surface. Penetrating sealants do not form a film, but use silicone or some other material, which is drawn into the wood and repels water. Some products are marketed as a stain/sealer which means a pigment has been added to the sealer. Stain/sealers are penetrating not film building. All penetrating sealers loose effectiveness over time and require re-application every few years to maintain optimum protection. Film building products may include exterior grade polyurethane, lacquer or varnish. Each have different compositions and characteristics but all function by forming a film over the surface of the wood. Film building sealants are subject to wear-through and peeling or flaking. Because penetrating deck stains do not form a protective film it is common practice, though not mandatory if the wood is treated, to apply either a penetrating or film building sealant to the stained wood. If a penetrating sealant is used no film forms and it must be re-applied to remain effective. Film building sealants only require re-application if there is evidence of wear through or if peeling and flaking occurs. Latex stains or paints that form a film do not require any type of sealant and should be re-coated with a similar product when signs of wear-through, peeling or flaking present or when a change of color is desired. Stains should not be applied over film building sealants because the pigments can not be drawn into the wood. Film building sealants must be completely removed, either chemically or by sanding, prior to re-staining. Stains should not be applied to wood that has been sealed with a penetrating sealer until enough time has passed for the sealer to have lost at least some if not most of it’s effectiveness. Lastly, film building sealants, like polyurethane, may be applied directly over existing film sealants. The existing sealant should be clean, dry and free from oils or waxy film. If the surface is glossy, lightly sanding, to scuff the surface, will ensure better adhesion between the old and new coats of sealant. I hope my response has been of some service in helping you chose the appropriate products for your porch project. This entry was posted in Decks, Exterior Maintenance, Flooring, Questions and Answers and tagged Deck, deck maintenance, deck sealing, deck staining, Decks, flooring, Porch, sealing, staining. Bookmark the permalink.